A couple of Christmases ago, we decided we’d have a go at making our own mince pies, which involved purchasing a non-stick muffin tray. The pies worked out well…and, since then, the muffin tray had sat on top of the kitchen cupboards looking a bit lonely and sorry for itself. Well, we never really cook sweet foods like apple pies or anything like that, we don’t cook Sunday roasts so never make Yorkshire puddings, so what were we going to use it for? And then, a good few months ago (that’s how long this recipe has been waiting to be posted), it suddenly dawned; a flash of inspiration – why hadn’t we thought of this earlier? We could make egg muffins! All of a sudden, it was one of those immediate things that had to be done, there and then. I opened the fridge to rummage around and see what ingredients we could come up with as a filling for our egg muffin recipe. Mmm, Turkish eggs with their fabulously yellow yolks, an awkward-sized little bit of salami (salam) wrapped up in a plastic bag, an equally awkward-sized block of Izmir tülüm cheese…and we’ve always got some onion and peppers in the cupboard and fridge, not too mention a heft supply of pul biber (of the hot chilli flakes variety). The great thing about this egg muffin recipe is I didn’t have a clue what I was doing. You can make it up and add whatever you like – whatever you think will go well with baked eggs. Our muffin tin has 12 holes for muffins so it was a case of just chopping up the leftovers from the fridge, adding the chopped onion and peppers, mixing it up and then sharing the mixture (roughly) equally between each section. Now it was time for the eggs. 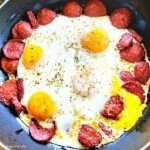 We are so spoiled in Turkey – look at the colour of those yolks! Hmm, how many eggs would we need for this egg muffin recipe? Well, we should point out that we usually buy the biggest Turkish eggs we can get our hands on and they’re often double yolks. 8 of these eggs whisked up with a good splash of milk which was then poured over the ingredients into each section of the tin. It was a lucky guess and the perfect amount. I was careful not to overfill the holes because we knew the eggs would rise in the oven – well, we hoped they would rise in the oven, shall we say. The oven was preheated to 180 degrees centigrade, the egg muffins were placed carefully into the middle of the oven…and then we both stood there, peering through the glass door to see what was happening. We felt like kids, but we couldn’t resist. And wow, the egg muffin recipe had worked! Happy days. Voila. The trial egg muffin recipe worked! The eggs had risen, souffle- style. As they began to sink a little when they started to cool down, they shrank away from the walls of the muffin tray and we were able to remove them…and eat them; a perfect weekend breakfast or brunch. This egg muffin recipe is quick and easy and makes a great weekend breakfast or brunch, especially if you have visitors. Preheat your over to 180 degrees centigrade (gas mark 4). With a pastry brush or kitchen towel, liberally grease each hole of your muffin tin with the oil or butter. Except for your eggs, add all the ingredients to a bowl and mix them together. Put roughly 2 tsp of mixture into each section of the muffin tin. Now pour the beaten egg mixture over the ingredients being careful not to fill the muffin sections right to the top. Place your egg muffins into the middle of your preheated oven for around 30 minutes. When cooked, remove from the oven and leave to cool for a few minutes before easing your egg muffins from the tin and serving. This egg muffin recipe is just a demonstration that you can use up leftovers in your fridge. There are no exact measurements - these are just a guide. You can experiment and alter them to your own taste. You might have noticed we used 8 eggs to make egg muffins but our recipe says 12 eggs. That's because the eggs we buy in Fethiye are particularly big. The cheese can be any cheese you like but preferably one that melts easily. They were soooo tasty. And from one egg muffin recipe, we’ve now opened up a whole new world of experimentation. We’ve made egg muffins with salted, jarred anchovies and tuna fish. We’ve used mushrooms, too. Got to say we were a bit disappointed with the mushroom experiment. Maybe they needed dehydrating a tad as they made the final egg muffin result a bit watery, we thought. We know from a previous Turkish egg recipe, ıspanaklı yumurta, that spinach and eggs are a perfect match so we’ll experiment with that healthy egg muffin recipe sometime soon, too. The peppers, onions and (sometimes) sucuk idea came from the fact that we love to make menemen – very similar ingredients. And, if you’re in England? 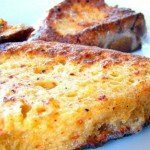 What about an English breakfast egg muffin recipe? Bit of bacon, sausage, black pudding? We’re in Turkey, however, and we’re more than happy with our sucuk fillings…as well as future experiments, too. We’ve added this egg muffin recipe to our Breakfast & Light Lunches section of our dedicated recipes page. What fillings would you use if you were doing an egg muffin recipe? We’d love to read your suggestions in the comments below.